Luxury lip balm oil with natural ingredients ideal affordable luxury gift for a clean beauty fix. ATLANTA - Dec. 18, 2018 - PRLog -- Save on holiday gifting with the most in-demand clean beauty lip balm on the planet. Curly D's Juteux lip balm, top clean beauty gift restock is only $7 for the holidays. Hurry to order the ideal affordable luxury gift with the best lip balm multi-active benefits including SPF15 that works for lips, cheeks, around eyes, brow, forehead, and wrinkles. Curly D's Juteux lip balm comes in gold luxury packaging, creating a glitz holiday impact. In the past, Curly D's Juteux has sold for as much as $30. The product is now sold directly to consumers and all orders are shipped the same day received before 4:45 p.m. Holiday shipping deadlines to place orders for Juteux are December 20th for first class and priority mail. To place orders for priority express is December 22nd for gift arrivals. Please contact (678) 744-4797 for customer service assistance. It's reported that the first persons expected to live to be 150 years old are already living today. Curly D is on a mission to fight the first signs of aging which starts with lips. It is lips that actually show first signs of aging and this occurs in the early 20s or sooner. Juteux offers all natural and organic ingredients, luxury natural lip balm oil for anti-aging to make lips stay looking younger at any age. This is the most powerful anti-aging treatment to help lips as they start to lose collagen and elastin, which occurs increasingly more over time. 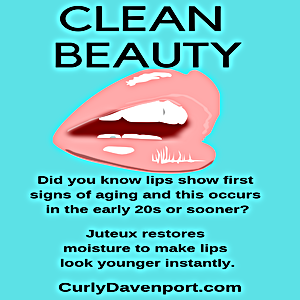 Juteux works to restore moisture to make lips look younger instantly. This is a very powerful anti-aging lip treatment to use when lips begin to lose volume, lines form around the mouth, and rosy color starts to gradually fade away. Make anti-aging an investment into your future for fuller lips.